Home Yu-Gi-Oh! Yu-Gi-Oh! Featured Writers Tribe-Infecting Virus is not mandatory. [YuGiOh Goat Format] Tribe-Infecting Virus is not mandatory. Of course, Tribe-Infecting Virus is a very good card and the majority of Goat Format decks have several reasons to include it. * It makes graveyard-dependent cards (i.e. Premature Burial, Call of the Haunted and BLS Envoy) live. * It maximizes the card advantage potential of Sinister Serpent. * It’s a versatile removal card that can get over tough monsters like Airknight Parshath, Chaos Sorcerer, Thousand-Eyes Restrict and aggressive swarms from Zoo decks. Also, consider it’s an out to lockdown monsters like Jinzo and King Tiger Wanghu. * It’s one of the few cards in the format that can counter Scapegoat and destroy all of the tokens before the opponent has a chance to use Metamorphosis on them. * It can open up an aggressive play and push the opponent for damage. * However, I don’t think it’s quite as universal of a staple as cards like Breaker, Sangan and Sinister. 1) Can I afford to run another non-LIGHT/DARK monster? BLS Envoy generally wants to have 5-6 LIGHT’s and 5-6 DARK’s. If using a Chaos deck, slots for LIGHT’s and DARK’s may be even more tight. Tribe may not fit. 2) Are face-up monsters more of a priority than face-downs? Tribe offers a lot of utility, but some of the most important monsters in the game are the flip effects like Dekoichi and Magician of Faith that the opponent use to gain advantage before they make aggressive play with face-up monsters in the first place. If you want more outs to face-down monsters, it may be worth swapping out Tribe-Infecting Virus for non-LIGHT/DARK monster like Mystic Swordsman LV2 or Exiled Force. 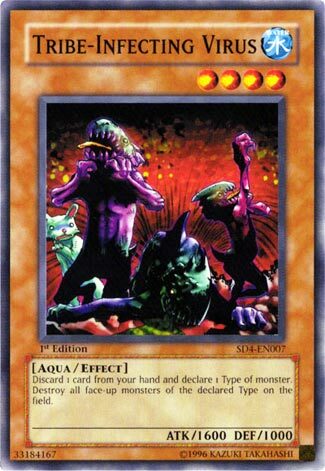 3) Do you have worthwhile monsters to discard?. If you use Thunder Dragons and/or Night Assailants, most likely yes. Standard Goat Control decks use Tribe-Infecting Virus because monsters like Airknight Parshath and Jinzo can be revived for aggressive plays later on, which can often be easier than Tribute Summoning them. However, if your deck is running 0-1 Tributes, you may need to resort to discarding cards you actually need. 4) Are you willing to risk a bad early game? The odds of getting both Tribe and an ideal discard monster (i.e. Airknight, Sinister) are low. Since Tribe’s stats are weak (beaters and Tsukuyomi both get over it with ease), it’s not a good card to play if you’re not using its effect. Abyss Soldier, on the other hand, is significantly harder to beat in battle and can at least function as a good beater if Sinister is not in hand. Maybe your deck can afford to hold onto Tribe for a while. However, if you deck already has a number of situational and late-game cards, Tribe can just add more bricking to your hand.